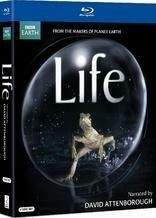 Celebrate Earth Day with the David Attenborough narrated documentary series for over fifty percent off at Amazon! The online retailer is selling 'Life (U.K. Version)' for just $27.99 (60% off suggested list price). From the award-winning BBC Natural History Unit, makers of "Planet Earth," this is the original UK broadcast version of "Life," with narration by renowned naturalist David Attenborough. Packed with excitement, revelation, and entertainment, this remarkable 10-part blockbuster captures unprecedented, astonishingly beautiful sequences and demonstrates the spectacular and extraordinary tactics animals and plants have developed to survive and thrive. If this must-own title isn't already part of your collection, click here to take advantage of this exceptional offer.